Firefox Live let you open Firefox from read-only media as CD, DVD or .dmg. Suggested from FreeSMUG user, as Firefox doesn't support running directly from read-only media, solution (as Firefox Portable win edition) is setting the profile folder to the local user's temp directory. This folder will be deleted when user log out. Requires OS X 10.4 or later. Clicking "Firefox Live" will open Firefox from your read-only device, wait a while before Firefox start. Temporary Profile folder will be deleted when user log out. 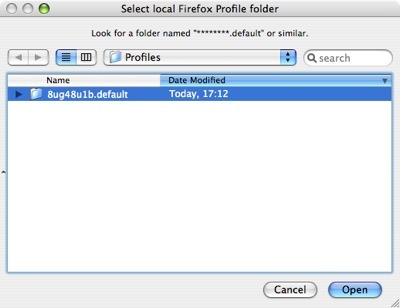 You can copy your local Profile folder to Firefox Live when "Copy local Profile" window ask you. So, if you wish to use your bookmarks, add-ons, history, personal data and preferences you already have on your system, just click "Copy" when prompt, and select the folder "/Users/<username>/Library/Applications Support/Firefox/Profiles/.default/" that you can burn on your read-only device. This option is disabled but you can edit file: FirefoxLive.app/Contents/Resources/script before you burn your CD or DVD. Change third from last line from "# copy_local_pref" to "copy_local_pref"
(that is removing # as comment). So you can have your custom profile folder on your read-only media and copy it when prompt. Watch fullscreen screenscast with notes. Firefox Live OS X script source code page.